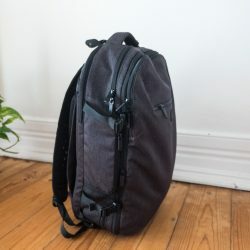 The original Aer Travel Pack 1.0 was the result of a successful Kickstarter campaign in 2016, which in effect also launched the San Francisco-based travel gear producer Aer. The Aer Travel Pack 2 is, as the name goes, its successor, aiming to improve on the original design. 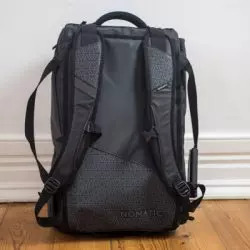 This travel backpack is originally geared towards “one bag travel”, which means it’s perfect for travellers like me who loves putting everything in a single carry-on backpack. The thing is though, the Aer Travel Pack 2 isn’t that big (it’s 33 litres) so if you’re planning to pack heavy, then this travel backpack might not work best for you. But what I love about this backpack is its design that fits well in an urban environment and I definitely won’t hesitate to bring this in my day-to-day travels. 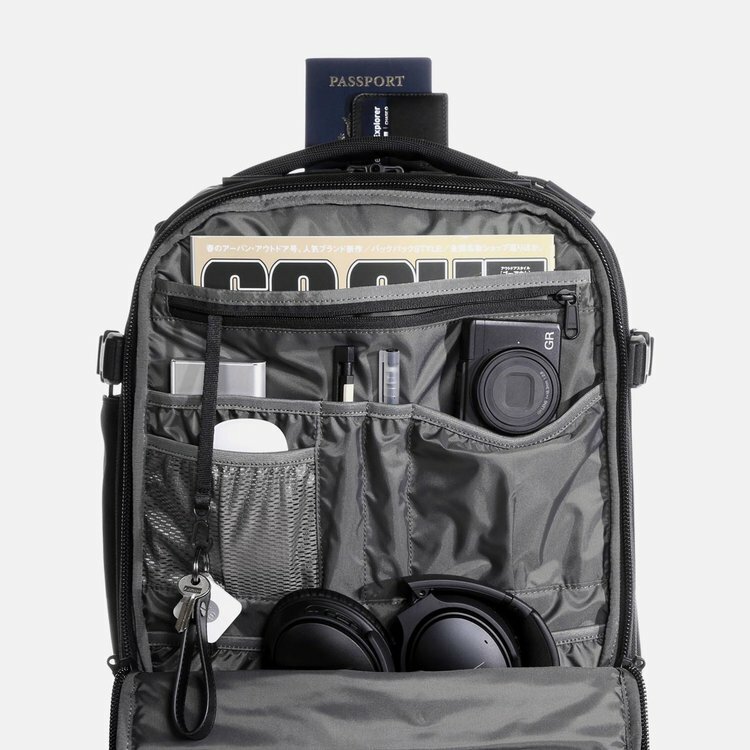 What’s got me more interested in this Aer Travel Pack 2 is the number of organization pockets it has — from its external pockets to its interior compartments. It’s definitely a big help when it comes to organizing my things perfectly, keeping the smallest yet important things such as my passport and visa up to the largest valuables I have like my clothes and camera. I think a great carry-on pack needs to be many things: it must be the right size, have a sleek design, and have enough pockets to organize your things. Often the second version of a product takes a key evolutionary step, working out the kinks from the original design — but is that the case with the Aer Travel Pack 2? Well, let’s take a closer look at its features. The first thing I noticed is the Aer Travel Pack’s design and material. Before I even got the chance to put my hands on it, it was pretty obvious that this is a quality product. Its exterior is made from a sturdy 1680D Cordura ballistic nylon, which should make this a bag that will last. The Aer Travel Pack 2 carry-on backpack is also available in two colours: grey and black camo. Both are definitely a thumbs-up for me, as these stylish but muted colors won’t get too many eyes looking at it when you bring it on business trips or commuting in a big city. Its minimalistic design is also a big win, and Aer has wisely chosen not to plaster its logo all over it (unlike other manufacturers like, say, Nomatic). This restraint has led to a backpack that looks good but isn’t too flashy either. What I love about this bag is how its main compartment opens all the way down. There are also two additional zippered compartments on its flaps that let you easily separate a few items. The shoe compartment along the bottom is another welcome addition. It can easily fit anything from some converse sneakers to sturdy boots, though thankfully it also hardly takes up any space inside the main compartment when not in use. You could also use this compartment to easily separate used clothes or a towel. Zippers may be a small detail but they’re definitely something that matters so much. Whether it rains or shines, your belongings will be nicely secured behind some YKK AquaGuard Zippers. 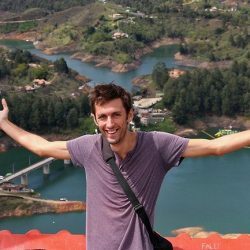 Certainly, not all backpacks have weather-resistant zippers (the Tortuga Setout, for example, lacks them), so this is a great feature worth mentioning. The zipper also have little rings attached letting you easily lock them with a padlock. Despite having several straps and handles scattered all throughout, the Aer Travel Pack 2 is advertised as a dangle-free backpack. It has a handle on its top and sides so it’s easy to lift the bag and bring it like a real carry-on. On its back panel there’s a pass-through for luggage, making it easy to attach to a rolling suitcase. The side straps will let you compress your things if it isn’t jam-packed or if you just want to slide some things around. Just one point about these side compression straps: they do hamper access to the main compartment a little bit. The Aer Travel Pack 2 has one zippered external pocket. I’d say it’s actually witty to have this extra pocket since a lot of people, like me, would need to access some random materials while travelling — and rummaging to the very bottom of my bag just to get a piece of item is the last thing I’d want to do. 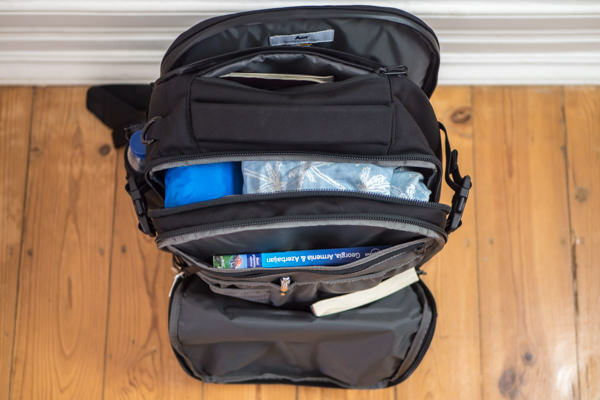 The external pocket goes halfway through the bag so you can fit medium-sized things such as a boarding pass, small books, or probably your favourite travel guidebook. There’s also another pocket on the top side of the bag. This comes really handy whenever you need to grab something quickly. It’s great for storing snacks, or a phone, or a pair of sunglasses. Its interior pockets are impressive as they provide lots of compartments of varying sizes. You can definitely store small stuff in here without losing it in just a big main compartment. It’s much easier to keep track of your things without having to buy extra pouches or packing cubes just to have it organized. There’s a pocket where you can fit sizes of a standard notebook, pens, phone, or perhaps a portable power bank. It’s also a perfect storage for bulky things like cables or charges. The good news about its interior pockets is that it doesn’t force you to make use of them. It’s just there – if you want it, you can use it. If not, it can just sit there without taking up much space. The laptop compartment is placed at the back, which in terms of ergonomics and load balancing I’m always a fan of. There’s no need to worry about sudden rainfalls because even the zippers used, a zipper from YKK Aquaguard is absolutely water resistant. If there’s one thing I’d point out in this carry-on travel backpack is its bottom part. Although it does have some sort of padding, it doesn’t guarantee that my laptop is secured whenever it touches the ground. I still prefer laptop compartment where the bottoms are cut some inches before its lowest point, so it doesn’t easily come in direct contact with the ground. Realistically, you’d have to throw this backpack around like a hulk for this to become an issue, but it would be nice to see such a feature added on a future Travel Pack 3. 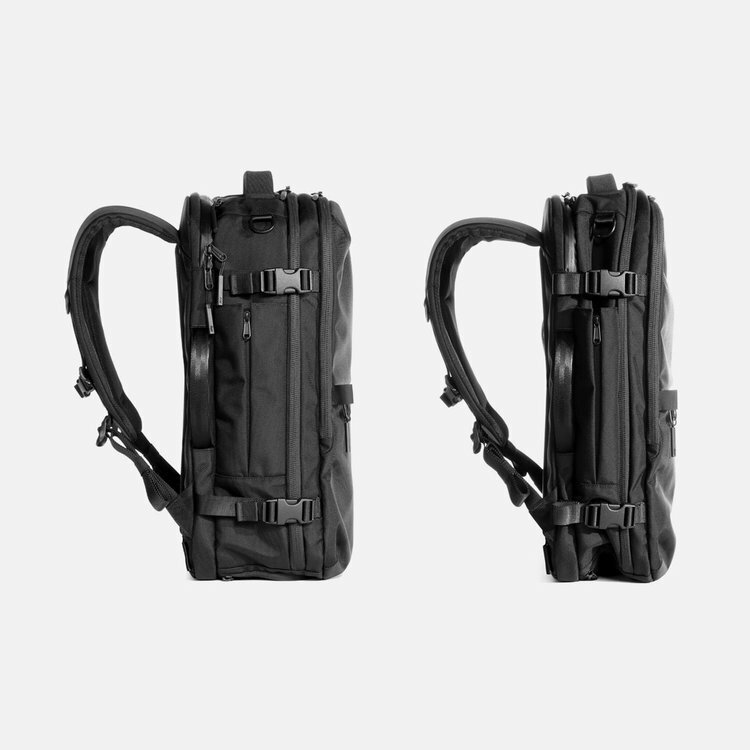 Aer Travel Pack 1 vs 2: How do they differ? The Aer Travel Pack 2 is very much an evolution and not a revolution. It does come with quite a few variations and improvements. Materials: The fabric used is the same as the first version. The only changes are the foams inserted which include sponge foam, EPE foam, and EVA foam. New Straps: This 2.0 version of the Aer carry-on travel backpack was redesigned with wider straps making it more comfortable when you bring it on your trip. Exterior (bottle holder) pockets: Compared to the two-sides pocket found in the front panel of version 1.0, this updated version has a smoother look with only one exterior pocket. 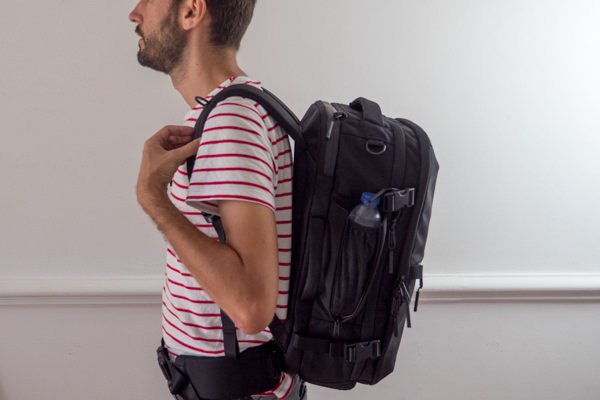 Laptop pocket: Unlike other backpacks which have their built-in laptop sleeves inside the main compartment, the Aer Travel Pack 2 offers greater accessibility by having a separate zipper. Lockable zippers: Aside from having high-quality zippers sewn on each Aer Travel Pack 2, it has an added security value with its zipper having holes. Optional Hip Belt: If you’re planning to pack heavy, you might want to use a hip belt for extra comfort. However, take note that this one is sold separately. Luggage Pass-through: It has a built-in strap where you can put your carry-on with another luggage (such as a rolling suitcase). How much does it fit? 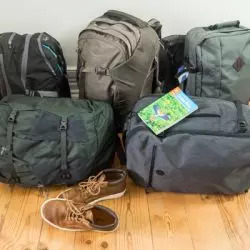 The Travel Pack 2 is definitely aimed at those travellers who want to skip the hassle of having their bags checked or paying additional luggage fees. But let’s consider the capacity of this travel daypack and how much it can really fit. This version 2.0 of the Aer Travel Pack measures 21.5” X 13.5” X 8.5” with a volume capacity of 33L. It weighs about 3.7 lbs (or 1.7kg) so it isn’t that much of a lightweight travel backpack. Technically speaking, its dimensions also exceed the requirement for some budget airlines. Realistically, most airlines don’t really pay close attention to these details so I’d say you’re good to go. I’ve traveled with much larger carry-on bags than this. The bag’s structure is really good, but keep in mind it’s not maximum carry-on size. Even if that’s the case, it can still fit a good amount of stuff. Plus points to the rigid structure of the backpack making everything inside easily compressible. The bag is very spacious for a commuter bag, perfect for a long weekend, but maybe a bit tight for a longer trip. 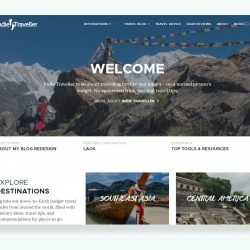 While the Travel Pack 2 might not be the first choice for any globe-trotting backpackers on a months-long trip, it’s great for the occasional shorter trip, or as a bigger-size everyday bag. Though the real key is, as I’ve mentioned in previous blogs as well, to pack smartly! 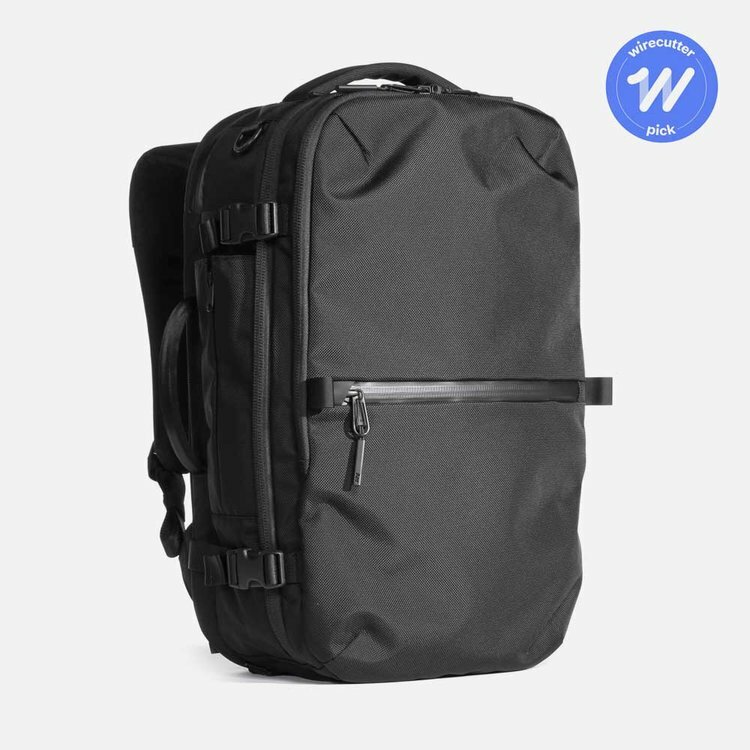 If you pack only the things you truly need, you’ll find this a highly versatile backpack. If you’ll use this bag a lot, I highly recommend adding the optional attachable waist trap. Water bottle pocket a little tight. 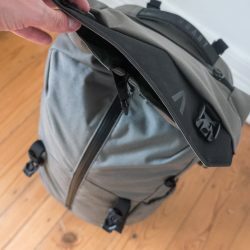 Overall, the Aer Travel Pack 2 is a great backpack! It didn’t disappoint as the successor of the well-loved Aer Travel Pack 1; it seems Aer has taken all the feedback it received on the original design and made some small but crucial upgrades. The size is perfect for everyday use or for a light packer, but maybe not for long trips.